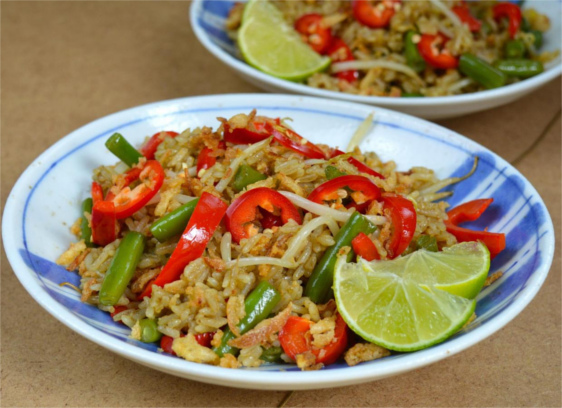 Everyone’s favourite Thai curry reimagined as a fried rice, infused with the smokiness of a hot wok – quick, simple and easily adaptable for meat eaters. - Heat the oil in a wok over a high heat. Add the curry paste and fry until it starts to separate, and then add the coconut milk, green beans and 50ml of water. Stir to combine, then cover and simmer for 5-6 minutes or until the sauce has reduced by half and the beans have softened slightly. - Uncover, and then add the rice, bean sprouts, peppers and soy sauce. Stir-fry for 2-3 minutes or until the rice is warmed through, the bean sprouts and peppers have softened slightly, and the curry sauce has been fully absorbed into the rice. - Serve with a sprinkling of crispy fried onions, sliced chilli and a wedge of lime on the side.